ROCK YOUR WORLD. LIGHT YOUR FIRE. 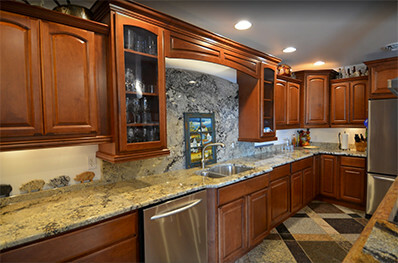 Nature's Granite is a family owned and operated granite and quartz sales and fabrication business employing some of the finest local skilled artisans. At Nature's Granite our eyes are open to capture your imagination, from the detail of an artistic creation, to a custom designed pattern. The Nature's Granite staff is proud to share your vision. Whether your project requires a kitchen counter top, fireplace surround, table top, bar top, vanity top, shower surround and seat, desk or conference room table; our scheduling and customer service departments offer a turnkey approach to meet your deadlines. Visit our showrooms in Morgantown, WV and Grantsville, MD to see the different selections of granite and quartz we have to offer. Meet our staff and let us help you reach your vision to embrace the beauty of craftsmanship with the refined process that enables Nature's Granite to stand alone. If you have any questions or would like to set up a consultation, fill out the form below. Also, feel free to upload your sketch, plans, etc. We'd love to work with you on your next project. "I was extremely pleased to work with Nature's Granite on the replacement of Countertops in 4 different properties I managed. They worked seamlessly with us and the property owners rental schedule and when the job was complete I did not need to send in a special cleaning crew because they left the completed job rental ready. The quality of the finished installs were absolutely magnificent. I would recommend them for any countertop or stone table or stone fireplace surround. Thank you for making my job easier with your outstanding customer service."